Sole di Sari is a 4 star campsite located in Solenzara in the Corsica region of France. Sole di Sari is a lovely small, 4 star campsite which is the perfect place for a relaxing holiday where you can sit back and unwind, away from the hustle and bustle of busier resorts. 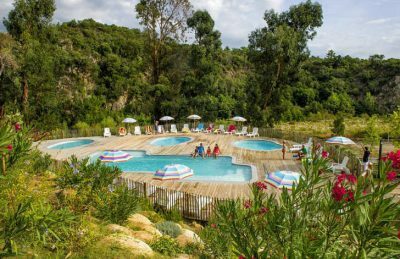 This wonderful campsite is located on the banks of the La Solenzara river between the mountains and the sea in the delightful Cote des Nacres or Coast of Pearls. The stretch of coast in which the campsite lies is part of a nature reserve and as such, offers some truly wonderful photographic opportunities, with beautiful panoramic views of the Corsican countryside being available throughout the whole campsite. Sole di Sari campsite is the perfect base from which you can explore the island. The nearest beaches are less that 1km away along the beautiful Corsican coastline offering plenty of water sports, sunbathing opportunities and of course space for children to play in the sand. For those looking to get out and explore the beauty of the island, the mountains and the forests provide ample opportunity. There are plenty of activities available on site and also nearby including hiking trips through the Bavella Mountains, mountain biking, climbing, canyoning and much more. Along with the stunning location, Sole di Sari campsite offers visitors a wealth of benefits. The river that runs alongside the campsite gives visitors the perfect place to relax with a spot of fishing, swimming, canoeing or kayaking and the onsite swimming pool is heated so can be used throughout the year. Sole di Sari campsite offers a comprehensive selection of activities and facilities on site and also nearby to ensure you have a fantastic family holiday. On-site activities at Sole di Sari campsite include table tennis, boules and a playground. Facilities available at Sole di Sari campsites include WIFI, restaurant, takeaway, bar, bakery, games room, animation team, washers and dryers. Accommodation at Sole di Sari campsite includes a range of 2 and 3 bedroom mobile homes that are available from Eurocamp and Al Fresco Holidays.